Are you wondering how you can encourage your baby to learn? Soon after babies are born, they begin to understand that the world is a pretty cool place. Your newborn may be fascinated by lights, while infants will start to tinker with things to see how they work. While your baby doesn’t know it, the world can also be a dangerous place. If given no other option, your child may start to play with household items that can pose a safety risk. For these reasons, a lot of parents buy exersaucers to provide a dedicated space for their baby to play. Activity centers can come with a seemingly endless number of features. You may want to take a few minutes to read about your options before purchasing one. Our review will go over the features, and recommend some of the best exersaucers and activity centers on the market. Use the links above to check the latest prices or read our in-depth activity center reviews below. Playtime: How Important Is It? Activity Centers and Exersaucers: What Are They? Long before your baby walks and explores on their own, they’ll want to touch, see, and hear new things. This instinct is pretty critical to their development, and tells them how the world works and responds to them. For the first few years, this exploration will be in the form of play. In recent years, plenty of research has been done showing the importance of play for children’s development (source). It’s important to give your child the right balance between challenging them and keeping them from getting too frustrated. What are the right kinds of play for different ages? Newborns: Babies fresh to the world still don’t have a lot of strength. Tummy time on a mat with an unbreakable mirror, or laying on their backs to look at a mobile, is enough to stimulate them (source). Three to six months: Until your baby can sit up on their own, mats and stroller rides with activity bars are a great way to encourage them to play and move. They love to make and hear noises and to hold and inspect simple toys (source). Six to 12 months: At this stage, your baby will start to be on the move. They’ll most likely be crawling and even start to walk. Activity centers and exersaucers become a great way to keep them safe, confined, and entertained. 12 to 24 months: During this time, your baby will get the walking thing down. They may begin to resist being confined in an exersaucer, but will still want a place to play that’s all their own. Activity centers that can convert to tables are a great option to keep them focused while encouraging independent movement. The activity center category is a broad one that includes many different kinds of toy centers and options. The one thing they all have in common is that they’re centralized areas of play, designed to encourage curiosity. Whether you have limited square footage or a giant playroom, there are great activity center options that will help your child learn and develop. Before you buy an activity center, though, you may want to take a few minutes to familiarize yourself with the different factors that may affect your choice. This way, you can make the right choice first time, avoiding multiple trips to the store in search of the perfect fit. Challenging your child is a great way to teach perseverance, independence, and give them an early sense of self-confidence. However, you also don’t want to set them up for failure. Some activity centers are made with multiple stages to grow with the child. As your little one begins to master certain tasks, you can add new toys or options to give them new challenges to conquer. Other activity centers are designed for certain age groups. These are usually easier to assemble and may take up less space. If you choose to go this route, it’s important to upgrade as your child grows. Some exersaucers have jumper seats at the center of them. If you’re like me, you spent much of your pregnancy reading and hearing about how much babies love jumping. I thought it was a given. Turns out, though, not all babies love jumping. Mine wouldn’t even look at a jumper seat. If you aren’t sure whether your baby will like this option, you may want to take them to the store with you and give it a try first. Activity mats are an awesome way to introduce play to young babies who can’t quite crawl or walk yet. Some mats are pretty simple and you can re-format them by adding different toys or sensory items. Other mats are packed with activity bars, mobiles and sound stations. Many activity centers will come with mats to be used as the first stage of play. Once your baby starts to crawl, they can lose interest in mats pretty quickly. You will also want to gauge your baby’s sensitivity to light and sound. Some babies don’t like noises that are too loud or lights that rapidly move and change colors. This can change as your baby gets older. If they’re sensitive to these things, and you buy a loud activity center, they might be afraid of it. In this case, look for a center that has volume control and will let you turn off the lights when needed. If you’re looking for a good activity center for your child, check out our product reviews below. We’ve found some great options for your child, based on age, lifestyle, and budget. This activity center will take your child from their newborn days to the toddler years. 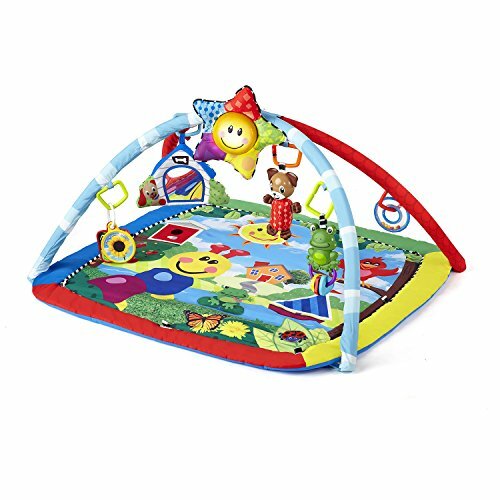 It contains three different stages: the activity mat, the infant chair, and the toddler play table. The activity mat is machine washable — perfect for newborns that spit up and have diaper blowouts. 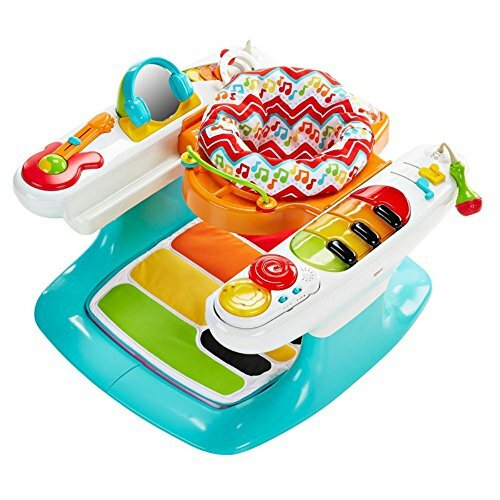 It has a removable piano toy that will encourage your baby to do tummy time and lift their hands to play. The infant seat allows them to sit in the middle of the table and touch several different shapes and sizes. The center doesn’t have wheels, so you won’t have to worry about your baby traveling without you knowing it! Once your baby no longer wants to sit in the seat, the center can be converted to a table that makes it easy for your baby to cruise and learn. The seating area can be replaced with a slide, encouraging your child to learn how things move, and test gravity. Legs can be removed for easy storage. At only 12 pounds, it’s easy to carry and move around the house. Seat height isn’t adjustable; some reviewers noted that it was too short for their baby’s legs. The gaps between some toys can trap baby’s fingers. 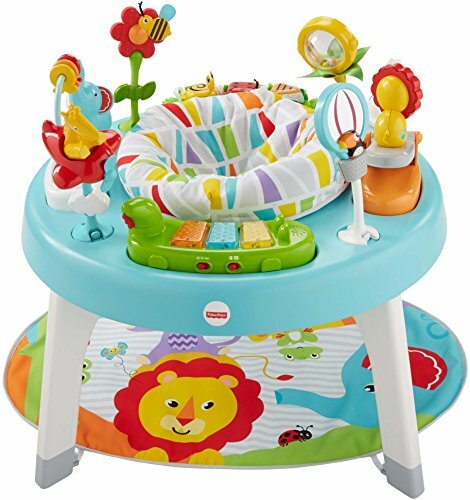 If your toddler loves sounds and music, this activity center and exersaucer may be a great option for you. This will encourage your toddler to walk and dance — two great, age-appropriate activities. For babies that can’t walk quite yet, the chair can be placed in three different directions. This will change the scenery for your baby and give them the chance to play with a variety of sounds and lights. Once your baby is walking confidently, you can take out the seat portion and convert it to a music corridor. Your toddler can stand on the mat and make sounds with their feet or explore the different sound options on the rails. At 21 pounds, it’s one of the heavier activity centers out there. However, that also makes it sturdy and more durable. If you have a toddler, you probably know that they have a way of destroying things you didn’t think were destructible. Four different stages for different age groups. Unique corridor design encourages walking. A variety of sound and light options to encourage hand coordination. Doesn’t collapse easily for storage. This activity center has a really unique design that makes it ideal for small spaces. 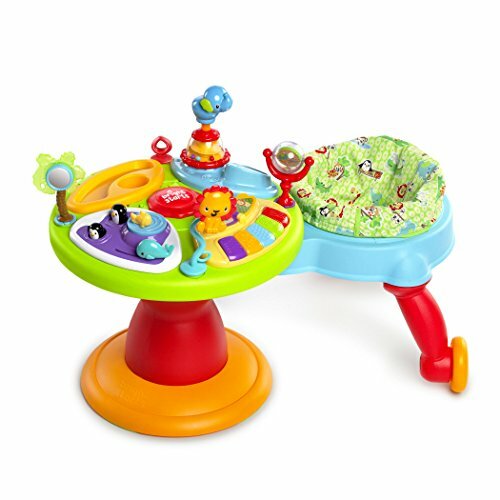 It consists of a smaller, round activity table containing different sensory activities. A detachable chair connects to the table when you need it, or it can be removed for areas that don’t have space. Once your child can safely sit by themselves, you can begin to put them in the movable chair. The chair attaches to the table and is able to follow a track around the entire table. This will give them the opportunity to control which activity they play with. Once your child can stand and cruise alone, you can take the chair away. The table will act as a standalone activity center. You can also pull it up to existing chairs in the home, allowing you to save space. Provides a variety of toys designed to touch, hear, and see. Can be used on carpet or hardwood floors. Not designed for newborns or babies that cannot sit unaided. As I mentioned previously, my child was not a jumper. My little one also didn’t like sitting in chairs where the legs had to be separated. As a result, we relied heavily on activity mats for exercise and learning time. This activity mat has a lot of great options for babies who don’t want to sit in a chair. The mat itself is covered with scenery, allowing you to start pointing out things to your child and encouraging language development. There are two bars that cross and give your baby something to look at while lying on the mat. The bars can hold various ring toys that you can move around and watch as your baby tries to grab them. The mat is machine washable, and the bars are detachable. Once your baby is able to sit up comfortably by themselves, this option gives them more room. At that point, you can lay the mat down and place other toys on it, to encourage touch and play. Doesn’t have weight or height restrictions. Comes with a detachable star that has light effects. Includes a classical music feature. Doesn’t encourage walking or cruising. 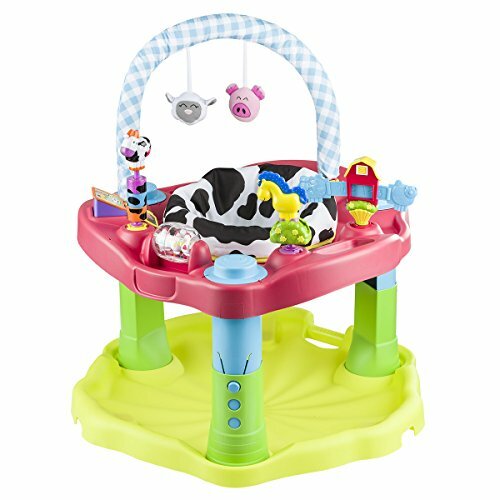 This activity center is designed for babies that like to jump, while still offering many of the great features of more traditional exersaucers. When seated, your baby can turn 360 degrees to reach a variety of toys. These include a piano, a bead chaser, and a few ring toys to encourage hand-eye coordination. The seat itself is attached to the railing with short bungee cords, allowing your child to jump and dance to the music. While typical jumpers require the use of a door frame, this one allows your child to jump anywhere in the house. The seat adjusts to five different height settings, allowing it to adapt to your child as they grow. However, it does have a maximum weight of 25 pounds. The structure hasn’t got wheels, so you can feel confident that your baby won’t stroll away. Combines the best features of jumpers and exersaucers. Features sound, light, and touch toys. Features a unique language introduction feature. Toys and frame are easily cleaned just by wiping. Once your baby outgrows the seat, there isn’t a lot of use for the product. This activity center has three different themes to choose from — Zoo Friends, Moovin & Groovin, and the Barnyard Center. The seat pad is machine washable and dryable, making it super easy to keep clean. When your child is in the chair, they can spin 360 degrees on their own. The toys are designed to develop hand-eye coordination, fine motor skills, and a strong core. 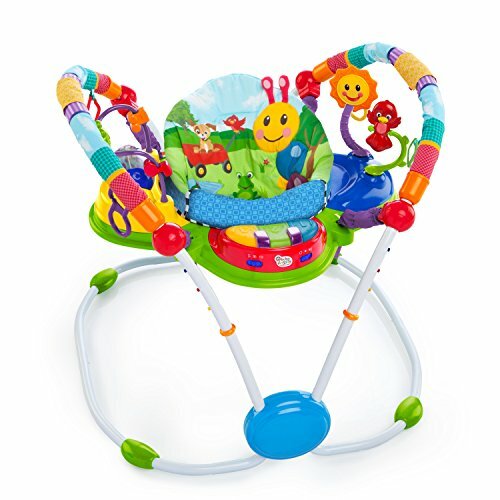 At 8 pounds, this activity center is one of the lighter products on the market. Anyone can carry it from room to room, or outside into the yard, to allow your baby to play in different parts of the house. Once your baby outgrows the seat, you don’t have to give it away. It can still serve as a fun table for your baby to use as they learn to walk, and cruise from spot to spot. The seat has a bit of spring to encourage jumping. Comes with a mobile to encourage neck strength. Has no music or sound features. Activity centers are a great way to entertain your baby before they’re able to move on their own. Depending on your child’s likes and dislikes, there are plenty of options on the market to fit their needs. My favorite is the Fisher-Price Activity Center. Because it grows with your child, it helps to highlight their interests and will make it clear when your child is ready to move to the next step. Do you have a favorite activity center? Are you pregnant and looking for one right now? Feel free to ask questions and share advice in our comments section below.